Preheat oven to 350 degrees. Using flour, roll out dough. Starting a few inches from the bottom, place 5 slices of salami across the dough. Add another row of salami on top of that. Continue with two rows of cheese and two rows of ham. Make sure there is a little dough left on top. Carefully roll dough up from the bottom. Place seam side down on a baking sheet lined with foil. Bake for about 15-20 minutes. Let cool for at least 5 minutes before slicing. Serve warm, with marinara for dipping. 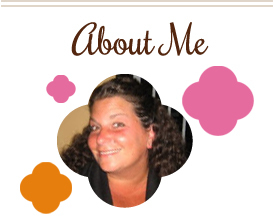 This entry was posted in appetizers, bread, cheese, Italian, QuickAndEasy. Bookmark the permalink. My dad has ALWAYS made stromboli at holidays and such. Now for me stuffs them with broccoli rabe and mozzarella! SO good. Yum! 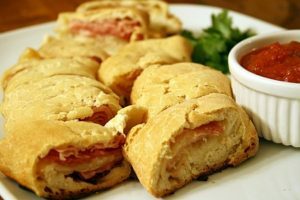 I love stromboli and this looks like a great go to recipe. Go Giants! Thanks so much for linking up at my game day blog hop! I’ve been making my own stromboli for about 3 years that one of my very good friends had taught me how to make from scratch of course. She just happens to be born and raised from Valle D’Aosta, Italy. The dipping sauce is the only thing that I’ve ever changed in which I go from marinara to salsa to bolognese sauce.